One of the most popular means of public transportation in Ontario is a bus. 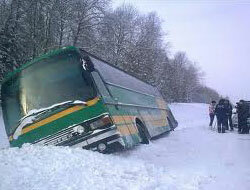 However, buses are considered means of transportation with higher risk. Firstly, they transport up to 40-50 passengers at the same time, and secondly, the passengers on the buses are not seat belted. As a result notwithstanding the fact that the buses are involved in Motor Vehicle Accidents less often than cars, they might overcome Car Accidents in the amount of victims. Victims of Bus Accidents may sustain different types of injuries, from bruises to multiple fractures, concussions, and injuries of neck, head, and chest. All these injuries might be accompanied by headaches, vomiting, psychiatric and psychological disorders, sleep, hearing and vision disruptions, and other medical problems, which may not begin immediately after the accident, but after some, even lengthy, amount of time.